Why does a banking panic lead to an economic crisis? Does it always entail a credit crunch? Traditional interpretations – rooted in the analysis of banking panics during the 1930s in the US – highlight the role of monetary (Friedman and Schwartz 1963) and non-monetary factors (Bernanke 1983). Bank failures are central to both interpretations. Their monetary effect is to decrease the money base through the freeze of deposits; their non-monetary effect is to increase the cost of intermediation because of asymmetric information. Our investigation of the banking panics in France in the 1930s also reveals that a flight-to-safety (rather than the monetary effects of bank failures) was the key mechanism of transmission of the crisis. 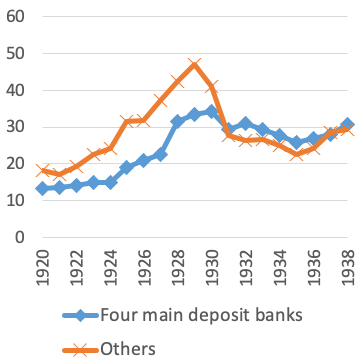 In the French case, the channel was not the interbank market, which was still underdeveloped in the interwar period (Ungaro 2018), but the shift of deposits from banks to non-bank savings institutions and the central bank. Banks were unregulated at the time, while savings institutions were subject to regulation and benefited from an implicit state guarantee because their assets had to be invested in government securities or cash at disposal of the Treasury. A very large number of banks failed, but the volume of frozen deposits due to bankruptcies was not quantitatively important compared to the amount of deposits that fled the banking system towards safe institutions. Because the banking panics led to a rebalancing of deposits between the banking and non-banking systems, the aggregate money supply did not fall. But loans did. The central bank and the savings institutions invested their new funds into gold reserves and cash with Treasury. The Treasury used cash from savings institutions to repay marketable public debt. No other financial institution replaced the banking system as a financial intermediary for loans to businesses. Thus, total loans to businesses fell sharply whereas aggregate deposits in the economy stagnated. The ratio of credit to money decreased from 60% before the crisis to 40% in 1931, and it remained at this level throughout the 1930s. The banking panic and the flight-to-safety effectively led to a major credit crunch. France suffered from a very severe decline in real economic activity in the 1930s. It was initially mildest than in some other countries, but the recession was highly persistent, with no sustained recovery. After the 1930–1931 crash, the industrial production index remained 30% below its 1929 peak (see Figure 1). Source: Baubeau et al. (2008). 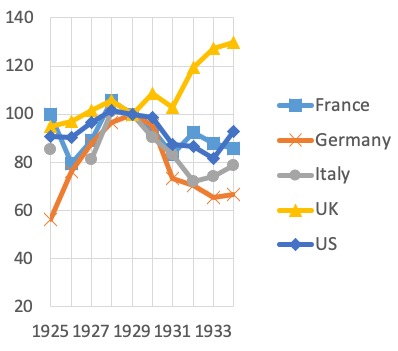 Although scholars acknowledged that some banking failures occurred in France during the period 1930–1932, the common view is still that they did not have significant economic and financial consequences. This view results from the lack of statistics able to provide a comprehensive quantitative picture of the crisis. Banks were not regulated in France before 1941, so that balance sheets were neither registered nor centralised by a supervisor. In the absence of banking statistics, the usual method to compute series of bank credit and deposits was to rely on the balance sheets of the four largest commercial banks and to assume that those banks represented half of the banking sector. Since these large banks did not experience difficulties and their deposits did not decrease in 1930 and 1931, the extant literature sees no evidence of a major banking crisis in France. Relying on extensive archival research, we have found the balance sheets of 404 banks from interwar France. It covers almost all institutions which collected deposits and made loans at that time. 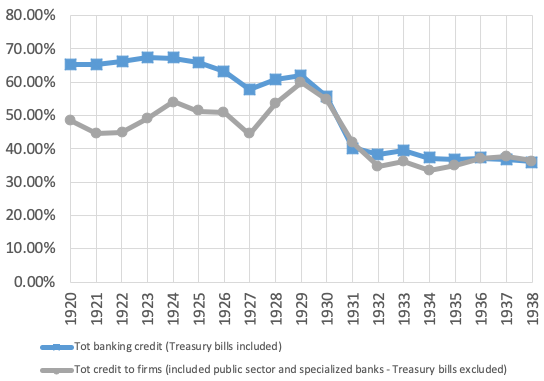 This finding gives a completely different view of the 1930–1931 banking panics (Baubeau et al. 2018). 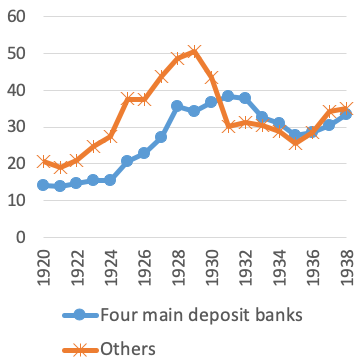 Whereas the four large commercial banks escaped the crisis, the remainder of the banking system experienced two dramatic waves of panic (end of 1930 and end of 1931), such that its deposits decreased by 40% between 1929 and 1931 (Figure 2). The decrease in credit was even stronger (-44%). Figure 2 shows nominal figures. 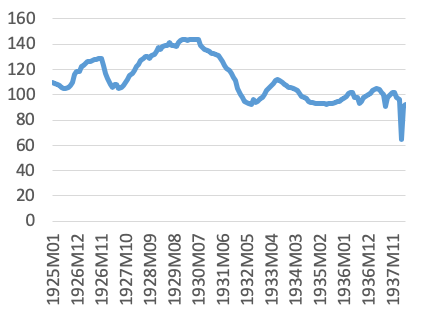 If one considers real figures, the drop in credit and deposits is still dramatic in 1930 and 1931 but these variables remain stable from 1932 (Baubeau et al. 2018). Banking panics were indeed concentrated in 1930–1931. Source: Baubeau et al. 2018. 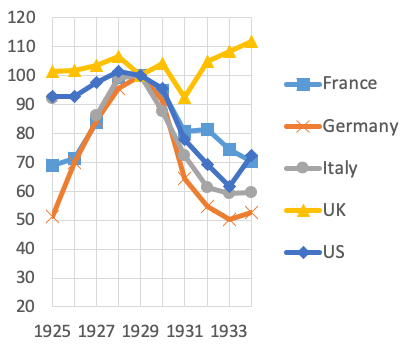 If we compare our new series with the deposit series available for other countries (Figure 3), France is no longer part of the group of countries whose banks escaped the 1930–1931 crisis. Source: Mitchell, International Historical Statistics for UK and Germany. NBER (Friedman & Schwartz) for US. Banca d’Italia ASCI for Italy. Baubeau et al. (2018) for France. Demand and time deposits in all commercial banks. Deflated using CPI from Mitchell. Banking theory explains the mechanisms of bank runs, but it is silent on where deposits go when they are withdrawn from the banking system. Traditional monetary interpretations point to a drop in the money multiplier and in the money base, either because cash is hoarded or because deposits remain frozen in bankrupt banks. Our estimation of hoarded cash and frozen deposits show that they cannot account for the bulk of deposits that fled the banking system in 1930 and 1931. Instead, most of these deposits went to savings institutions (Caisses d’Epargne). Depositors (both individuals and corporations) moved their funds from banks to saving-institutions (Figure 4). A part also went to the central bank which accepted deposits by non-bank entities. In addition to this domestic story, France received capital from abroad because it remained on the gold standard and was deemed a safe country in the midst of international financial contagion (Sicsic 1993). 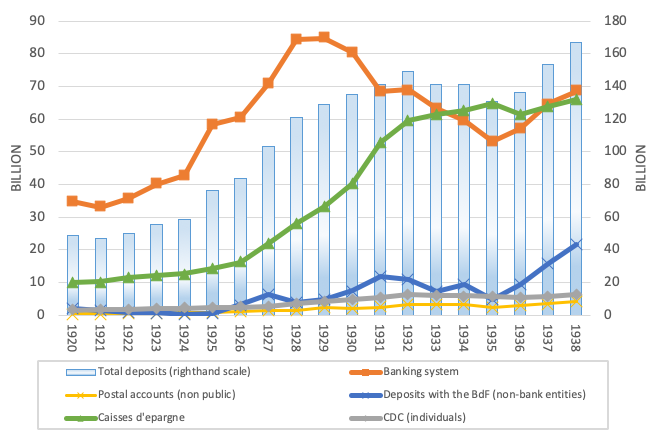 As a consequence, despite a massive panic in half of the banking sector, the total amount of deposits (in bank and non-bank institutions) increased (Figure 4). We estimate that the net sum of deposits exiting the banking system and foreign capital flowing into France was absorbed mostly by the Caisses d’épargne (50%). The rest was hoarded in cash (25%), deposited with the central bank (17%), and frozen in bankrupt banks (8% only). Source: Baubeau et al. (2018). How can a country experience deflation and a decline of about one third of real activity, while at the same time the money supply increases? The answer to this question lies in the dramatic decrease of credit. Figure 5 shows the ratio of total credit over total money. These aggregates include deposits and credit in bank and non-bank institutions (saving institutions, state-led credit institutions, etc). Issuances of stocks and bonds are not included in this graph but also experienced a strong decline beginning in 1929. A credit crunch occurred because the institutions that received deposits during the banking panic – namely the savings institutions and the central bank – did not lend to the economy. 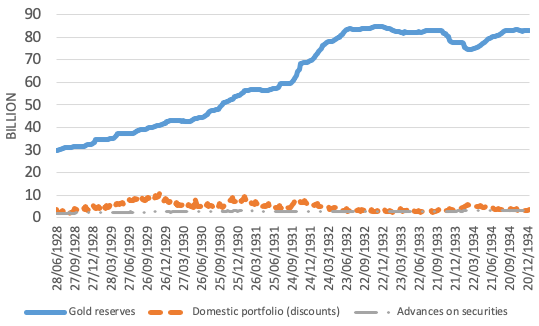 New cash deposited with the savings institutions (Caisses d’épargne)was in fact deposited with the Treasury and used directly to repay marketable public debt, which decreased between 1928 and 1933. The large banks which were not affected by the crisis deposited 25% of their assets with the central bank. The central bank very modestly increased its lending to the economy (i.e., to both banks and non-banks) and it was dwarfed by the dramatic increase in gold reserves, the ultimate safe asset (Figure 6). Gold reserves doubled between 1929 and 1932. This new picture of the French Great Depression shows that a broad view on the financial system is needed to understand the channels and consequences of banking panics. The previous literature on the Great Depression in France had underestimated the size of the banking crisis because it was limited to a subset of banks. The French case demonstrates that some minor macroeconomic assumptions and extrapolations on monetary statistics can be misleading and introduce large, persistent biases in historiography. Moreover, it would not have been possible to understand the mechanisms of the crisis without looking at non-bank institutions. Runs towards safe assets, and rebalancing between the banking and the non-banking sectors are not new phenomena. These historical lessons should be of interest to those today interested in the interaction between a shadow banking system and the regulated banking system. The flight to security and credit crunch that occurred during the Great Depression in France shows that what matters for financial intermediation and the real economy in times of crisis is the composition of the assets of the institutions that serve as a safe refuge. How monetary policy and public policies can affect this composition remains a challenge. In France in the 1930s, the gold standard mentality (Eichengreen and Temin 2000) clearly prevented the central bank and the Treasury from restoring the proper functioning of financial intermediation. Authors’ note: The views presented here are those of the authors and should not be attributed to the institutions with which they are affiliated. Baubeau, P, E Monnet, A Riva and S Ungaro (2018), “Flight-to-safety and the credit crunch: A new history of the banking crisis in France during the Great Depression,” CEPR, Discussion paper 13287. Bernanke, B S (1983), “Nonmonetary effects of the financial crisis in the propagation of the Great Depression," American Economic Review 73(3): 257–276. Caballero, R J and A Krishnamurthy (2008), “Collective risk management in a flight to quality episode,” Journal of Finance 63(5): 2195–22. Eichengreen, B and P Temin (2000), “The gold standard and the great depression,” Contemporary European History 9(2): 183–207. Friedman, M and A J Schwartz (1963), A monetary history of the United States, 1867-1960, Princeton University Press. Gorton, G and A Metrick (2012), “Securitized banking and the run on repo,” Journal of Financial economics 104(3): 425–451. Kindleberger, C P (1986), The World in Depression, 1929-1939: Revised and enlarged edition (Vol 4), University of California Press. Mitchener, K J and G Richardson (2016), “Network contagion and interbank amplification during the Great Depression,” NBER, Working paper w22074. Sicsic, P (1993), "The Inflow of Gold to France from 1928 to 1934", Banque de France. Ungaro, S (2018), “Do central clearing parties reduce risk on repo markets?” Paris School of Economics. Reinvestigating the history of the US Great Depression through the lens of today’s mechanisms, Mitchener and Richardson (2016) observed that interbank connectedness also worked as a channel of transmission at that time, with hinterland banks moving their deposits to reserve-city banks. The reserve-city banks functioned as safe havens, and decreased their lending to businesses (and increased their portfolio of safe government securities and central bank liabilities).